In the last post I mentioned that my socks ended up too tight, probably because I attempted to change the pattern a bit. So instead of being put off socks, I was a bit more put off changing patterns until I understand the science of stitches a bit better. If I'm not changing a pattern, I have to find one that's almost exactly what I want. After hours of searching for free knitting patterns, I came across Ravelry.com. This is probably the single best thing I'll ever discover for my knitting, and something I would have known about long ago if I knew other knitters. Practically every pattern ever published anywhere, all on the one website! And it has every other feature we could want as well, one of my favourites being that I can see what the pattern looks like when other users have knitted it. I'm in awe. So of course I signed up, and my profile can be found here. I have since found plenty of projects I eventually want to knit. The first one I got started on is this pair of socks. It's such a lovely pattern; I really hope it turns out a bit better than my last effort! These socks are fun to knit, but I'm really looking forward to finishing them. I always imagined socks were difficult to knit and didn't expect to be making them already, so I'm quite proud of this project and I can't wait to see them off the needles! I look forward to seeing the finished socks! Have you thought of posting a WIP wednesday post the next time you update on a project your knitting? 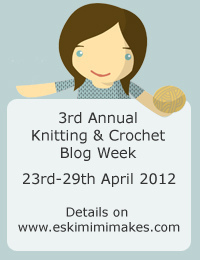 WIP stands for 'Work In Progress' and theres lots of knitting bloggers who do WIP posts. I only learned about WIP Wednesdays recently but I think I will start doing that. It might motivate me to start a new WIP as often as possible! I have no idea why you can't see the follow icon, but I do know that you can add blogs via your dashboard, that's how I follow non-blogspot blogs. Let me know if you find it!